We’ve written a lot on the site about mini or single-person trampolines, which are great for fitness and for kids or toddlers. But the topic of today’s article is something very different: we want to look at large trampolines. This can be a great options for families with multiple children or for adults who want as much space to jump as possible. In this article, we’ll look at the benefits and disadvantages of large trampolines, answer the much-asked question of “what is the biggest trampoline in the world,” and recommend five of the best big trampolines available for sale on the market today! We’ve looked around to find the 5 best large outdoor trampolines that are currently available for sale. All of these are among the top rated trampolines in their class and all of them qualify as 17 foot trampolines or larger. 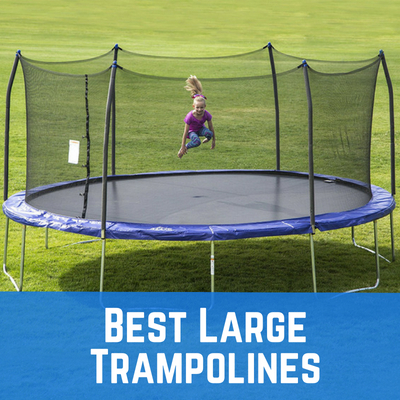 Obviously, the main factor we looked at while compiling this list was size, but we also wanted to find trampolines that were reasonably-priced, durable, and had other features to recommend it besides just being big. We’ll discuss these factors in the reviews below. The Galactic Xtreme rectangle trampoline – produced by Happy Trampoline – is a great choice for a large trampoline because it’s actually available in several sizes. The biggest and most popular is 10 feet by 23 feet, but you can also purchase it in 10×20, 10×17, and 14×16 sizes. 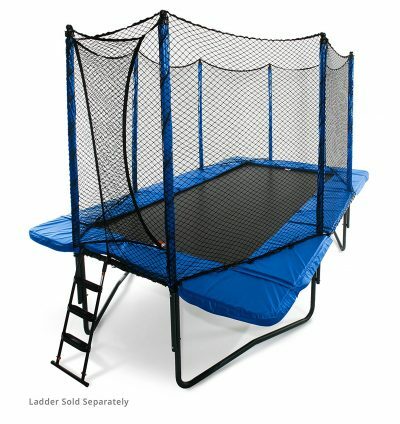 This makes it a versatile choice no matter what size of large trampoline you’re looking for. But another big selling point that made this our best large trampoline for sale is the weight limit. Thanks to a 3.0 millimeter gymnast-grade steel frame, this trampoline can support 550 pounds at a time, far more than most other trampolines of any size. Click To See Best PriceThe Happy Trampoline website brags that you could drive your car onto the trampoline if you wanted to – and that’s probably true. 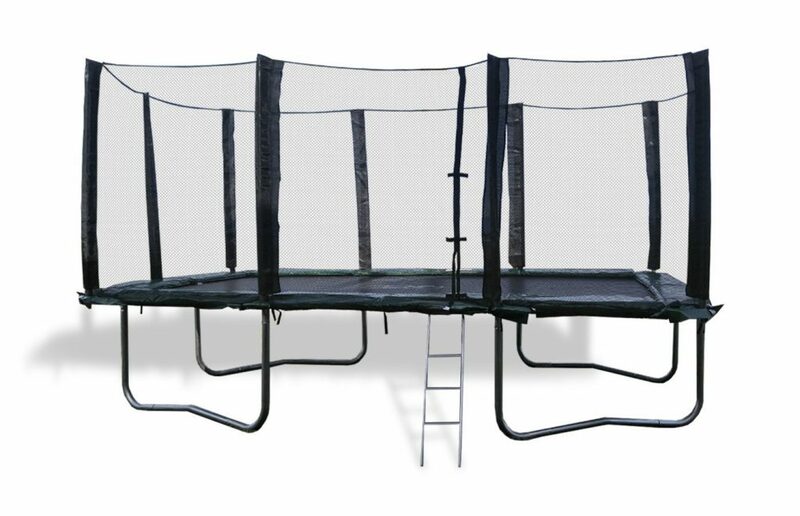 This makes this a great large trampoline because it means that your entire family can probably jump on it at once if you like – and if you have several active kids or they want to have friends over, the Galactic Xtreme will be able to handle all of them with no problem. But don’t worry – this heavy duty large trampoline is safe, too. The safety enclosure is connected with T-brackets, which we’ve written about before in other articles because they stay in place better than other types of enclosure attachment. The net itself is a polyester mesh that’s held with poles that are covered in soft foam, so your little ones (or, heck, even you and your fellow adults) won’t hurt themselves while they’re jumping. This trampoline is pretty expensive – which is gonna be a common theme of this article, since larger trampolines obviously require more materials to make and will therefore be at least a bit more expensive. The exact price of the Galactic Xtreme depends on the size you choose to purchase, but for the biggest trampoline size available (the 10×23 model) the price is $2,806 from Amazon and sometimes goes up to $3,595 on their website. Still, if you’ve got the cash to spend on the best large trampoline model available, this is one of the biggest and best around! Like a lot of trampoline names, the “SWTC17BWS” doesn’t exactly roll off the tongue. But if you’re looking a great large trampoline option that won’t put a dent in your wallet, this is far and away the best of the cheap large trampolines for sale. For only $319 (at time of writing – sometimes it’s been seen for as high as $464 USD) you get 17 feet of fun backed by the Skywalker guarantee of quality. Even the higher of those two prices is less than a quarter of the second-cheapest option on this list! The padding on the enclosure poles is also not as thick – the frame is shaped in such a way that you probably won’t hit them while you’re bouncing, but if you know that your kids can go a little crazy on the trampoline you might want to consider a safer option. If you’re an inexperienced trampoline builder, the fact that you can get this large trampoline with expert assembly for only $85 more is a deal you can’t afford to ignore. All in all, Skywalker is known for building great trampolines, and their biggest model is no exception, even if you’re probably going to have a hard time remembering the name. The PowerBounce is probably the safest large trampoline available thanks to its incredibly high-quality safety net design made of highly durable materials with patented Fail-Safe™ backup systems. This will ensure that even the rowdiest children are unlikely to successfully break the net – and even if they do, the PowerBounce comes with a lifetime warranty, so it won’t stay broken for long. Honestly, we could go on and on about the pros of this great model – the easy assembly, the incredibly high bounce potential, and so on. Let’s just all agree that this is one of the best large trampolines for sale, and if you have the money to buy it you should definitely consider it as an option. 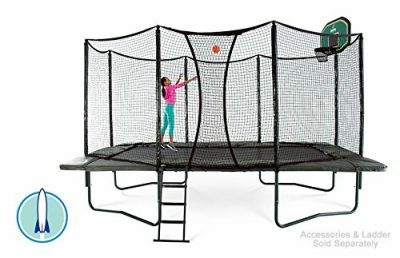 This JumpSport is a rectangular trampoline available for “only” $2,000 USD (hey, it’s cheaper than most of the other options on this list.) The “StagedBounce” technology it’s named for is a patented tech that’s said to reduce the chance of being injured when you land on the surface of the trampoline. JumpSport is a popular brand, and it’s not hard to see why. Like the PowerBounce, this has convenient rest areas and an overlapping doorway that will help make the enclosure safer for children. The whole construction is also fairly waterproof and has UV protection so it won’t get damaged if you leave it out in the sun. If you’re looking for a safe and solid large trampoline that won’t let you down, the JumpSport StagedBounce is a great choice! This is it. The single biggest trampoline for sale to the common consumer. The appropriately-named Goliath was created by Vikan Trampolines and measures at an astounding 16 feet by 24 feet – the absolute mother of all trampolines. AN IMPORTANT NOTE about the Goliath is that it’s not actually available from Amazon, and we can’t vouch for the shipping or the price offered by Vikan. Another important note is that the size of this trampoline is matched only by its cost at $5,000 to $6,500 Canadian dollars. But if all you care about in a trampoline is sheer size, there’s simply no competition. In addition to its impressive diameter, the Goliath has a weight limit of 800 pounds, more than enough to accommodate anyone who might possibly want to jump on it. It’s also quite sturdy (as you’d expect) and surprisingly safe thanks to excellent padding, although a netted enclosure is going to cost you extra. For most consumers, the Goliath will not be a practical option. But if you want to buy the trampoline that dwarfs all others, this is the one for you. What is the biggest trampoline in the world? The world’s biggest trampoline is actually several trampolines that have been attached to each other to make a single continuous jumping surface. It’s called Flip Out, it’s located in Glasgow, and it’s 63,000 square feet in size. Obviously, no commercially available trampoline is ever going to be able to compete with that – most of us don’t have trampolines that are anywhere near that size! 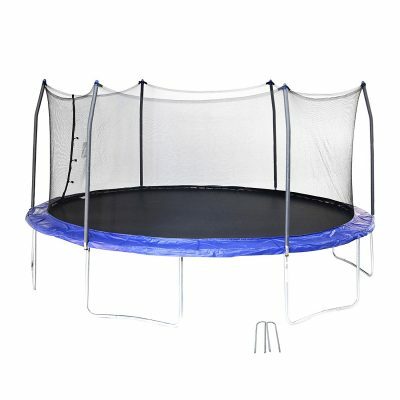 What is the biggest trampoline for sale? The biggest trampoline available for sale is the Vikan Goliath, which stands at an outstanding 16 feet by 24 feet. You can learn more in our review above. Are there large trampolines for adults? Of course! Trampolines aren’t just for children, even if we often think of them that way. Large trampolines are actually often better for adults because they may have a higher weight capacity and because they have more room to jump around. If you’ve ever jumped on a kids’ trampoline you might have noticed it’s very easy to accidentally jump off sometimes if you’re not careful. What are the benefits of a large trampoline? The biggest benefit – and the one that’s probably pretty obvious – is that larger trampolines have more room to jump around than their smaller counterparts. This is ideal for having several children jump at once or for giving adults more room, so it’s an especially good choice if you have a large family and you all want to be able to jump at once! Large trampolines may also have higher weight limits and will frequently give you a bigger bounce because they have more strings. You can learn more about high bounce trampolines here. Are large trampolines more expensive? This is the biggest downside of large trampolines – yes, they are often quite a bit more expensive. This is because larger trampolines require more materials to make. Do large trampolines have a higher weight capacity? Usually, but not always. We’ve indicated with large trampolines also come with high weight capacities in our reviews above. Well, we hope this article has helped you learn more about large trampolines – why you might want to purchase one, where to find them, and which of the biggest trampolines is best for your particular needs. If you’ve got a favorite 17 foot trampoline (or larger) that we forgot, or a question we neglected to answer, please be sure to leave a comment so that we can keep this article up-to-date with the most recent and accurate information possible!